In 2013, tenants of the Roanoke Centre for Industry and Technology (RCIT) met with staff from the Roanoke Valley-Alleghany Regional Commission (RVARC), City of Roanoke Economic Development Department and Greater Roanoke Transit Company (Valley Metro) to discuss the potential of providing transit service into the industrial park. Several large tenants of the RCIT had expressed to the City a growing need, by employees, for a transit stop closer than the existing one of 3/4 – 1 mile from their facilities. Further, many company representatives indicated that prospective employees were discouraged from applying for jobs at the RCIT due to a lack of efficient bus service from their homes into the industrial park. This concept of disparity between the location of low income households and appropriate employment opportunities is known as spatial mismatch. Through a series of meetings to address this and other issues, a transit needs assessment survey was developed and administered to RCIT employees. 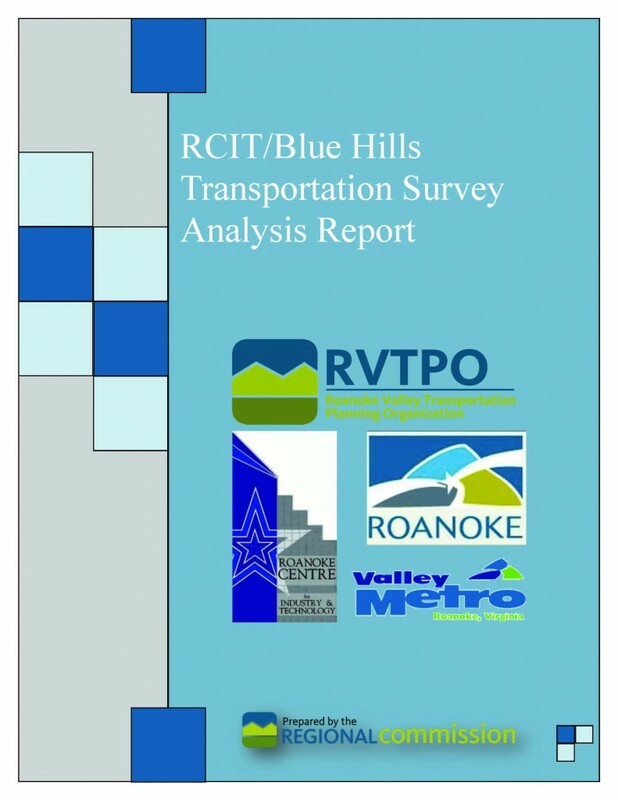 In March 2014, RVARC planners presented the RCIT/Blue Hills Transportation Survey Analysis Report to the RCIT tenants. Overall, there were 528 respondents to the survey. The overall response rate for the survey was 23.4%, based on the 2,255 employees in the RCIT. The concerns raised by the tenants regarding the unwillingness of many prospective employees to apply for jobs in the park due to a lack of sufficient transit, were considered and reflected in the survey analysis. Question #6 of the survey asked about the mode of transportation the employee uses most often to get to work during the average week. Of the 521 respondents to this question, 85% or 440 indicated that they most often used a single occupancy vehicle (car [driving alone]) to travel to work. Forty-eight respondents or 9% who stated that they most often used a bus to travel to work. Question #10, “In the past year, how often did you use Valley Metro to get to work?”, received 516 responses. Of those respondents, 83% or 426 indicated never having used Valley Metro in the past year as a means to get to work. The remaining 17% of respondents (90) indicated using transit, at some frequency to get to work. Of those users, 52 (58%) indicated that they ride the bus daily to work. In Question #11, 517 respondents replied to whether or not they would use Valley Metro or a specialized bus service that provided them with frequent and convenient service to businesses along Blue Hills Drive. While 53% or 273 respondents said they would not consider using bus service, 47% or 244 indicated they would. It is important to note the willingness of employees to consider using a new or specialized service, nearly half, when currently 83% do not use bus service at all. Based on the survey response rate, there is a desire among employees in the RCIT for bus service. This is based on 47% (244) of the respondents indicating they would consider using some sort of transit service to Blue Hills Drive. This is significant insofar as 83% of all respondents indicated not using bus service at all. 17 percent (90) of respondents use Valley Metro to get to work anywhere from once a month to daily. Many of these individuals have a commitment to using Valley Metro service and would most likely continue and/or increase their frequency in riding if the service were provided to or along Blue Hills Drive. In terms of economic development and employment opportunities, many respondents and tenants indicated that more people would apply for jobs at RCIT if there was more convenient and nearby bus service to Blue Hills Drive. Since the release of the survey analysis, Valley Metro and RVARC staff continue to work with the RCIT tenants to improve transit service to employment destinations in the industrial park. Such an improvement to the transit system would help eliminate the spatial mismatch, make jobs available to more people, and solve employment issues with RCIT businesses. This entry was posted in Transportation on November 20, 2014 by Bryan Hill.